Nice to see Lou back in the mix…and as things quiet down here in Real Life-land, maybe I can even start working on getting some long-delayed guest submissions up on Toppy at long last. But in the meantime, the Wheel of Catch-Up has landed on my 2012 visit to Los Angeles, chronicled in photo form over at Tower Site of the Week and in audio form here, spanning the Los Angeles and adjacent Riverside-San Bernardino markets. I believe this update actually completes the Los Angeles market, at least among full-power licenses, with the addition of little KISL 88.7 out on Catalina Island. 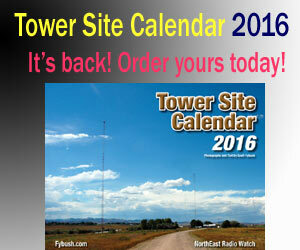 Oh, and did you notice that Tower Site Calendar 2015 is now available for pre-order? ‘Cause it is! The 2 clips from KSPN 710 are from August 2009 and not from December 2012. Indeed they are. I don’t know why they never got posted back then, but they were in the folder on my hard drive, so why not?